Bring a gemstone-like sparkle to your eyes. Four clear and rich eye colors. Available from September 1, 2016 at all counters. Four colors in each set produce sparkle, luster and clarity, bringing a stunningly gorgeous finish to your eyes. ･An elegant sparkle created from rich pearls. 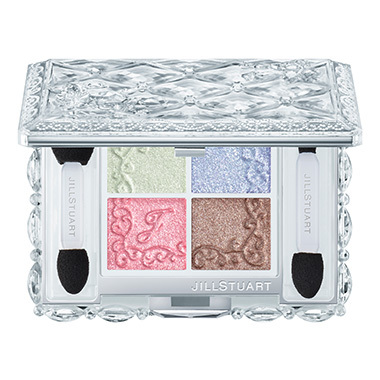 A set of four eye colors that bring you dazzling eyes, wreathed in a sparkle like crushed gemstones and an elegant luster. ･The moist and creamy A “Clear Eye Base” is richly formulated with firm oils that work easily into your skin, providing perfect coverage. It helps to bring out the sparkle of the colors layered over the top while also heightening the hold of makeup, providing a glistening luster while banishing dullness and making your eyelids bright and appealing. ･The softy and gentle B & C “Jewel Couture Color” and D “Deep Color” are richly formulated with light, smooth, and highly translucent oils, giving a feather-light feeling of application and realizing clear and full-bodied color. Powder with a crystal oil coating helps to reduce loss of pearls, maintaining a beautiful and sparkly finish for as long as possible. ･The essence-in-base formulation provides a smooth and moist sensation of use and highly translucent, popping color. ･Supplied with a pair of two-headed applicator tips that feel smooth on your skin while applying an even layer of rich color. Use the large tip for the Clear Eye Base, the medium tip for the Jewel Couture Color, and the small tip for the Deep Color to provide beautiful gradation. ･The theme of the compact design is the sparkle of gemstones. Princess cut tiles are decorated with a chain link of jewelry broaches, creating a varied and enticing sparkle with real depth. The arabesque pattern along the edges is decorated with sparkling beads.